Katie Stubblefield’s wood cut prints, oil paintings, sculptures, and sight-specific installed projects explore order, chaos, and entropy. Her color-soaked oil paintings and value-based prints take visual cues from the natural resources used to complete her sculptural works and installed projects. Salvaged trees, rebar, concrete, discarded clothes, deconstructed architecture and disused vehicle parts are examples of the artist’s working materials that are interwoven, tangled and refigured in space. Stubblefield’s imagery is informed by site visits, forensic photography, first-hand accounts and evidence of changed/damaged/evolving environments. Katie Stubblefield (b. 1966, Cookeville, Tennessee) lives and works in the Los Angeles area. She received her BFA from Middle Tennessee State University, Murfreesboro, and an MFA from California State University, Long Beach in 2001.Her works have been included in several group exhibitions including CSU Main Gallery, San Louis Obispo Museum of Art, Jamie Brooks Fine Art and POST Gallery. 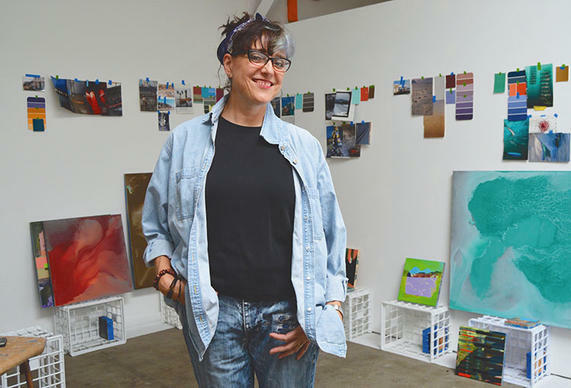 Stubblefield has received an Individual Artists Fellowship and micro-grant in support of both her two and three dimensional works from the Long Beach Arts Council. She is part-time faculty at Coastline Community College, Newport Beach. City of Angels, Gates of Hell-The Advocate Gallery, West Hollywood, CA,Co-Curators: Marc Arranaga and Robin Wyshak, Ph.D.
Koll, Juri Jr, Venice Institute of Contemporary Art: 2017. CreateSpace Independent Publishing Platform, January 25, 2018. 110-111.